Hal has access to the latest market, economic and industry research so that he can customize his speeches and seminars with useful up-to-the minute information. 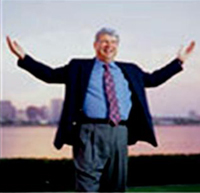 Hal�s book titled Online Business Research is scheduled for publication in Summer, 2003 by Prentice-Hall Publishing. This desk-top reference book will help readers conduct meaningful marketing, human resources, financial and legal research via the Internet. Noted author of more than 200 published articles. As core adjunct faculty at National University, Hal designed and started the MBA program in New Venture Development. He also taught management and marketing courses there and is currently teaching marketing and sales at the University of California at San Diego. Hal created and is teaching Online Market Research in the E-Commerce program at San Diego State University. Consulting and Business Development Experience. Hal has extensive experience in creating business plans, marketing strategies and implementation programs for small to $50 million businesses and organizations, helping many go public. As the Director of the San Diego Chamber of Commerce's Small Business Development Center, Hal and his team of consultants helped over 300 businesses get a good start while counseling over 1000 businesses each year. Masters Degree in Business Administration, Law School.